Students taking trigonometry courses are familiar with the Pythagorean theorem and the basic trigonometric properties associated with the right triangle. Knowing the different trigonometric identities can help students solve and simplify many trigonometric problems. Identities or trigonometric equations with cosine and secant are typically easy to manipulate if you know their relationship. By using the Pythagorean theorem and knowing how to find cosine, sine and tangent in a right triangle, you can derive or calculate secant. Draw a right triangle with three points A, B and C. Let the point labeled C be the right angle and draw one horizontal line to the right of C to point A. Draw a vertical line from point C to the point B and also draw a line between point A and point B. Label the sides respectively a, b and c, where side c is the hypotenuse, side b is opposite angle B, and side a is opposite angle A. Know that the Pythagorean theorem is a² +b²= c² where sine of an angle is the opposite side divided by the hypotenuse (opposite/hypotenuse), while the cosine of the angle is the adjacent side divided by the hypotenuse (adjacent/hypotenuse). The tangent of an angle is the opposite side divided by the adjacent side (opposite /adjacent). Understand that to calculate secant you need only find the cosine of an angle and the relationship that exists between them. So you can find the cosine of angles A and B from the diagram by using the definitions given in Step 2. These are cos A= b/c and cos B=a/c. Calculate secant by finding the reciprocal of the cosine of an angle. For the cos A and cos B in Step 3, the reciprocals are 1/cos A and 1/cos B. 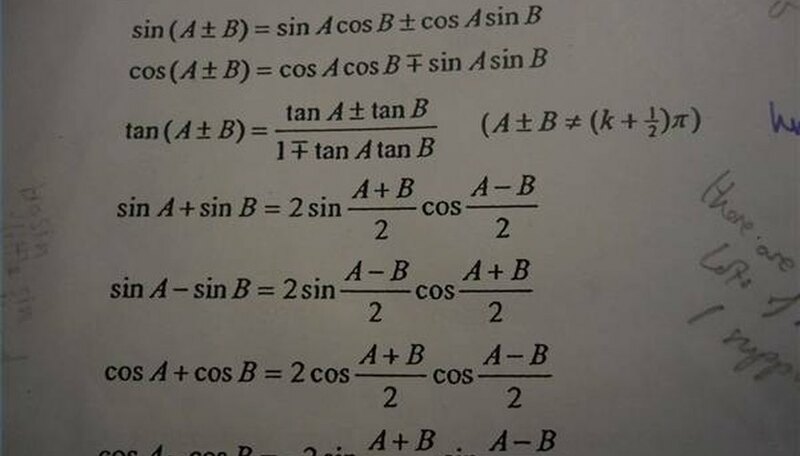 So sec A = 1/cos A and sec B= 1/cos B. Express secant in terms of the sides of the right triangle by substituting cos A =b/c into the secant equation for A in Step 4. You find that secA= 1/ (b/c) =c/b. Similarly, you see that secB=c/a. Practice finding secant by solving this problem. You have a right triangle similar to the one in the diagram where a=3, b=4, c=5. Find the secant of angles A and B. First find cos A and cos B. From Step 3, you have cos A= b/c=4/5 and for cos B=a/c=3/5. From Step 4, you see that sec A= (1/cos A) =1/ (4/5) = 5/4 and sec B= (1/cosB) =1/ (3/5) =5/3. Find secθ when "θ" is given in degrees by using a calculator. To find sec60, use the formula sec A = 1/cos A and substitute θ =60 degrees for A to get sec60= 1/cos60. On the calculator, find cos 60 by pressing the "cos" function key and input 60 to get .5 and calculate the reciprocal 1/.5 =2 by pressing the inverse function key "x -1 " and entering .5. So for an angle that is 60 degrees, sec60 = 2. Remember that these relationships only apply to right triangles. You can also find the reciprocal of sine and tangent in the same manner as in the tutorial where the reciprocal of sine is cosecant (csc) and the reciprocal of tangent is cotangent (cot). See the Resources. Note that on some calculators the inverse function key may be denoted by "1/x." You can also use an online calculator (see the Resources). .
Tolen, Ida. "How to Calculate the Secant." Sciencing, https://sciencing.com/calculate-secant-5149784.html. 24 April 2017.